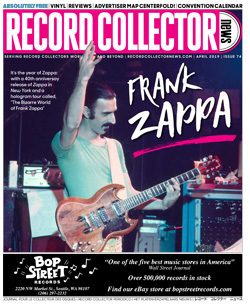 We at Record Collector News readily admit that most of the editorial in the periodical covers music and recordings initially released during the last century or music documentaries that chronicle endeavors and melodic moments from the sixties and seventies. Once in a while we take delight in discovering or at least drawing attention to someone with a fifty-or-sixty-year music “career” who has had a unique journey, long-overlooked, but worth checking out. Publisher Jim Kaplan suggested I introduce RCN readers to my friend, Travis Pike, a Los Angeles-based singer/songwriter, filmmaker, actor and book publisher, in 2017 and 2018 enjoying a well-deserved critical and commercial renaissance. I have worked with Pike on my books chronicling The Beatles and The Doors. Travis had a few singles written between 1964-1974 released independently, a dozen featured in movies, including two movie title songs, and many more never before recorded or released that were part of his original live performance repertoire. Now, a half-century later, at 74, he’s finding audiences in Europe and the U.K. airplay on satellite radio. I’m reading articles about him on British blogs like Psychedelic Baby and Fear and Loathing, and in British print magazines like Shindig! And in America, he’s doing podcasts for Goldmine magazine, and Open Mynd Collectibles internet radio, as well as being featured in articles and reviews on Forgotten Hits and Cave Hollywood, and in Goldmine, Ugly Things and now in Record Collector News. Travis’ first movie title song was “Demo Derby,” arranged and produced by Arthur Korb at Ace Recording Studios in Boston, and recorded by The Rondels. That 28-minute action featurette opened in 1964 with Robin and the Seven Hoods and Viva Las Vegas, before being booked as the “second feature” that played on thousands of screens across the U.S.A. with the Beatles Hard Day’s Night. So, while Travis was in Germany, his music was on the same screens with Frank Sinatra, Elvis Presley and the Beatles! And that rare Pike Productions recording of the Rondels’ “Demo Derby,” is still sold online. In 1964, while performing in Germany, Travis came to the attention of Polydor and Phillips Records, but before anything could come of it, he was sidelined by an auto accident that sent him Stateside for reconstructive surgery. In 1965, his father, Jim Pike of Pike Productions, “discovered” Travis’ talent and starred Travis and featured 10 of his songs, including the title song performed by the Montclairs in the 1966 cult-film Feelin’ Good. A 45 single of the Montclairs performance of the title song, flip-side by Travis and the Brattle Street East performing “Don’t Hurt Me Again,” while rare, is also still available for purchase online. Travis and the Brattle Street East performed eight of his songs in the film, but until Travis came into possession of a few badly-aged reels from the movie, had them restored at Deluxe, and posted six restored music clips on Youtube, it was believed all were lost. Two clips of Travis and the Brattle Street East’s performance on the Charles River Esplanade in Boston caught the attention of garage rock fans, and State Records, in the U.K, released the first ever limited edition vinyl 45 of “Watch Out Woman” and “The Way That I Need You” captured directly from the original restored monaural optical soundtrack, that went on to be listed number 3 in Shindig! magazine’s Best of 2017 issue. Today as his few early singles are commanding big bucks on auction markets, I asked Travis to explain how this came to be, and what it’s like to be getting queries on stuff that goes back before the Beatles came to America! 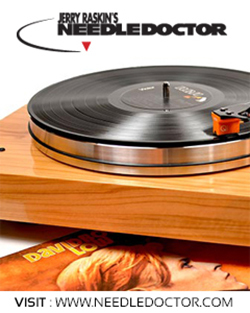 Q: Your back catalog is reaching new ears and record collectors. Discuss your sixties and seventies work. A: The songs on the Feelin’ Better CD include seven I performed in the 1966 movie, Feelin’ Good, but re-arranged in my original configuration, with sax, intended for my 1964 German-Italian showband, the Five Beats. A lot of the music on that CD sounds more fifties than sixties, especially “Rock ‘n’ Roll” one of my favorites, and “End of Summer,” which I wrote with German and English verses. Without lyrics, it became the theme for the movie The Second Gun, a feature-length documentary about the investigation of the assassination of Robert Kennedy, nominated for a 1973 Golden Globe. Frankly, I was disappointed when neither of those songs, both personal favorites, were chosen for Feelin’ Good. Most rare and sought by collectors is the 1967 Alma Records 45 of Travis Pike’s Tea Party’s “If I Didn’t Love You Girl” and “The Likes of You,” recorded at AAA Studios in Boston. To date, “If I Didn’t Love You Girl” has been released on three compilation albums, The Backyard Patio (Germany), Tougher Than Stains (England) and most recently the 2017 release of le Beate Bespoké 7, also in England. 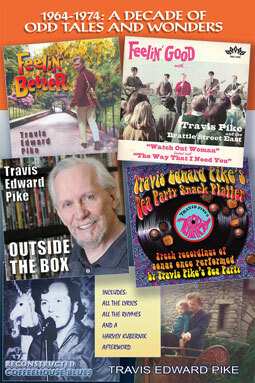 Travis Edward Pike’s Tea Party Snack Platter is very close to my original mid-sixties sound, especially on rock numbers like “Okay,” “Oh Mama,” “You Got What I Need” and “If I Didn’t Love You Girl,” the “A” side of our only group single release. In 2003, I met the legendary Geoff Emerick in Hollywood at Capitol Records, where he produced and engineered The Syrups, an album featuring five songs by my brother Adam and the Syrups’ cover of my “If I Didn’t Love You Girl,” which brings the total up to four albums for that song. A: The most recent album, Outside the Box, is rooted in the sixties, featuring works I wrote and orchestrated, but never heard until Adam saw the orchestration and decided he wanted to hear it. Thanks to Adam, “The Andalusian Bride Suite” is no longer confined to a file drawer, and may now be heard by one and all. “Flying Snakes” and “Witch” were both composed for my unpublished 1974 rock opera, Changeling, and “Lovely Girl I Married,” always musically exciting, now a song about lasting, mature love, profited enormously from new lyrics. A few weeks ago, I gave Judy a commemorative gold record of “Lovely Girl I Married” for our 50th anniversary celebration. And that album also features “Star Maker,” a recent song by this old retread trying to figure out what he has to do to get traction in today’s market. Q: I made it to a few sessions of yours in 2013 and 2014 at Adam’s studio while preparing to write the Afterword to your just published new book, 1964-1974: A Decade of Odd Tales and Wonders, a 374-page, photo-illustrated memoir of your musical career between 1964-1974. 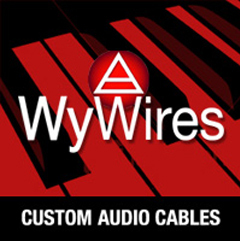 In your musical endeavors, there are post 2013 collaborations at Adam’s studio, recording, mixing, and producing, but also your pre-Adam music. There are apples and oranges going on here. A: True, but most of the songs we’ve recorded I composed and arranged between 1964 and 1974. Few were ever recorded and most are still controlled by the record companies that released them. My new recordings, released through Otherworld Cottage, all date from 2013, and many evolved significantly since those early days, thanks in large part to my youngest brother Adam’s technical skill and musical talent, and that’s how my “demo” recordings became masters. For songs especially popular with my long-ago live audiences, we tried to sound as much like the original arrangements as possible, so Adam’s creative input becomes most clear in Reconstructed Coffeehouse Blues, in songs I originally performed solo, accompanying myself on guitar. To my acoustic finger-picking and strumming, depending on the song, Adam variously added fretted or fretless electric bass, drums, piano, organ, harmonium, electric rhythm guitar, and electric lead guitar. In a nod to the old Travis Pike’s Tea Party version, I contributed a “pop-toy” effect to “You and I Together,” and with Adam’s assistance, created the “instrumental release” to “Don’t You Care at All?” from recorded audio of helicopter gunships, machine gun fire, jet aircraft, rockets, and napalm explosions. Q: I know toward the end of the last century you wrote a musical screenplay I’ve just learned you nearly got to produce in England in the early nineties. Can you tell me more about that? A: That property was Morning-stone, a rock musical fantasy adventure set in contemporary England’s Midlands and in Morningstone, a parcel of metaphysical real-estate located in the Celtic Otherworld. I’d pre-recorded most of the music, so it was no pig-in-a-poke for investors, who’d be cross-collateralized by the release of a soundtrack album, creating a separate income stream, potentially as large or larger than the box office returns. For it, I’d assembled an excellent production staff, scouted, budgeted, scheduled the production, and even had a completion bond standing by, but three times we lost our production window, twice due to failures in the funding over which I had no control, and once, at the beginning of negotiations with Paramount for a split-rights deal, when the “bankable star” I needed to secure presales in Europe and Japan was pulled by his manager for an unspecified medical reason. In fact, I never abandoned this musical fantasy. Now retitled Changeling’s Return, it’s back on the front burner here at Otherworld Cottage, and I’m working on a book version to publish next year. The CD Mystical Encounter (Songs from Changeling’s Return) is up on Youtube and currently sold on Amazon and CD Baby. It’s not a soundtrack album, but it is an excellent introduction to music in the story of the American rock star, whose out-of-body experience triggers a sudden and profound commitment to the environment and a dramatic change in his music, its lyrical content and purpose. Very nice and well written. Best of luck in all your endeavors. Waiting to see what the future has in store for you. May it all be good.